The men’s tennis team had a fantastic start to its season on the sun-soaked California coast. The players were able to come out on top in three of their six grueling matches over the break. They played four top-fifteen teams, including NESCAC rival Middlebury and one Division I powerhouse in Georgetown University. With multiple upsets, the team moved up thirteen spots in the standings, and currently sits ninth in the nation. The Cardinal’s spring opener came against a tough Hoyas squad. The team fought hard, but ultimately was bested 8-1 in the scrimmage. Dhruv Yadav ’18 claimed the only win for the Cardinals as he defeated Bart Panarese at the number six singles position. He was down early, losing the first set 5-7, but came back firing, winning the next two 6-2, 6-1. The rest of the group lost close matches, including Liu at first singles by a count of 6-3 and 7-5. Jake Roberts ’17 and Joachim Samson ’19 were both defeated in straight sets, with twin scores of 6-4, 7-6. The next matchup was against the 11th ranked team in the nation, Pomona-Pitzer Colleges. The teams split the six singles matches evenly, but Wes was unfortunately swept in doubles action, dropping the difficult non-conference matchup, 6-3. The big winners were Steven Chen ’18, Tiago Eusebio ’18, and Yadav at the second, third, and sixth positions, respectively. After quickly getting blanked in the opening set, Chen was able to bounce back with a blistering 6-2, 6-4 defeat over Graham Maassen. Eusebio and Yadav both won their matches in straight sets, as Eusebio took out his opponent 6-3, 7-5 and Yadav claimed victory over his foe 7-5, 6-2. The third match of a long two-week stretch saw Wesleyan earn its first win of the spring season against another local school, University of Redlands. The Cardinals were able to hand the number 14 ranked Bulldogs their first defeat of the season with the 7-2 win. At singles, the Cards got points in four of the six positions, with wins at number one, two, five, and six. Liu started off a bit slow, losing the first set 6-3. Still fresh, he was able to respond with wins of 6-4 and 6-3 to claim the upset. Chen and Samson each won definitively in straight sets. Chen posted a 6-2, 7-6 victory and Samson earned a 6-1, 6-3 win. Yadav was able to clinch his third consecutive triumph with a come-from-behind win over Jake Ly, the sixth seeded player for Redlands. With a 6-4 loss in the initial set, Yadav rallied with wins of 6-1 and 6-3. 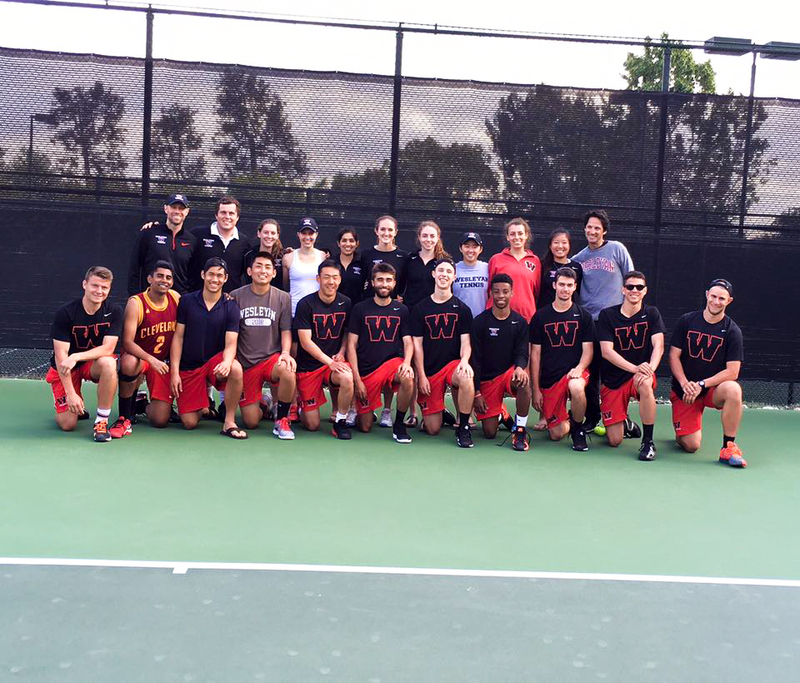 Wesleyan’s three doubles pairs were able to come up with an impressive sweep. Liu and Chen won 8-6 at the number one position. Zacko Brint ’16 and Greg Lyon ’17 defeated their opponents 8-4 at number two doubles. The last win of the doubles portion came from Sam Rudovsky ’16 and Samson with an 8-4 slaughter at the number three position. The last match of the California trip, and perhaps the best match in recent years for the men’s tennis program, came against Trinity University (TX). The Cardinals were able to knock off the fifth-ranked team in the country, 6-2. This unbelievable upset came with wins from first, third, fifth, and sixth singles, and second, and third doubles. Liu was able to earn his second win of the season at the top spot with a 7-5, 7-5 victory over Adam Krull. Eusebio, Samson, and Yadav were all able to cruise to straight-set victories over their tough opponents. At second doubles, Chen and Liu came out with a close 8-5 victory. Rudovsky and Samson took care of business, eviscerating their opponents with an 8-3 decision at the number three doubles spot. In the last match of the break, the Cards were barely edged out by NESCAC rival, Middlebury. The Panthers, ranked third in the nation, were able to squeak by the Redbirds with a 5-4, nail-biting win. Wesleyan started off with a quick 2-1 lead after the second and third doubles teams were able to each pull out 8-6 wins. In the singles matchups, the Cardinals could only grab points from the second and fourth positions. Samson won in straight-sets, and with a blistering start, he was able to gain control of the match with a 6-0 win in the first set. The second set was much closer, with Samson squeaking out a 7-5 decision. Chen went down in the first set 6-4, but was able to rally and take the next two, 6-4 and 6-1, respectively. Liu discussed some of the more exciting matches on tap for the remainder of the Cardinals’ season. “We are looking forward to playing Bowdoin, Amherst, and Williams, since Wesleyan has not beaten one of these three in a very long time,” he said. Wesleyan returns to the court on Saturday, April 2 with an interstate conference matchup against Conn College. In 2015, the Cardinals blanked the Camels, and the squad from Middletown has pulled off three consecutive wins against Conn College.